Audi on Thursday gave us an early look at its Q8 concept vehicle, which it will unveil on January 9 at the 2017 Detroit auto show. The concept previews a production model of the same name, due before the end of the decade. The production Q8 will be a new full-size SUV positioned above the Q7 in Audi’s lineup. Audi says this concept is near production ready. 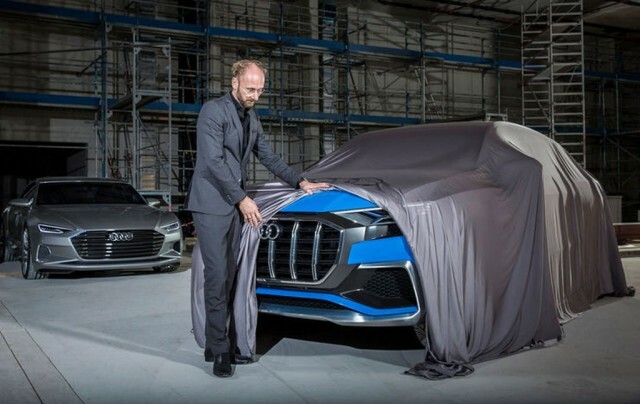 The teaser shots, one of which includes Audi design boss Marc Lichte, show a stylish crossover SUV with a coupe-like profile. Audi says the concept has four equally comfortable seats despite the roofline. The move upmarket is certainly significant, but so is the Q8 concept’s styling. Recent Audi models have been accused of being overly conservative, with looks that are barely evolved from the last generation. The latest A4, especially, is hard to tell from the last version. The Q8 could mark a sea change for Audi styling. The signature singleframe grille is considerably wider than on other Q models, but it also has more shape to it and more vertical elements as opposed to horizontal slats. Audi says many of the design elements are reminiscent of the Quattro sports car of the 1980s, including the wide but flat C-pillars and the flared shoulders above the wheels. Those shoulders give equal emphasis to the front and rear wheels to underline the presence of the quattro all-wheel-drive system. Audi gave no further details on the Q8, but the automaker is sure to share more during its press conference in Detroit. We’ll be there to report on those details. For more on the Detroit auto show, visit our dedicated hub.